Crackling is something I used to do years ago when I was creating a lot of primitive tole paintings. 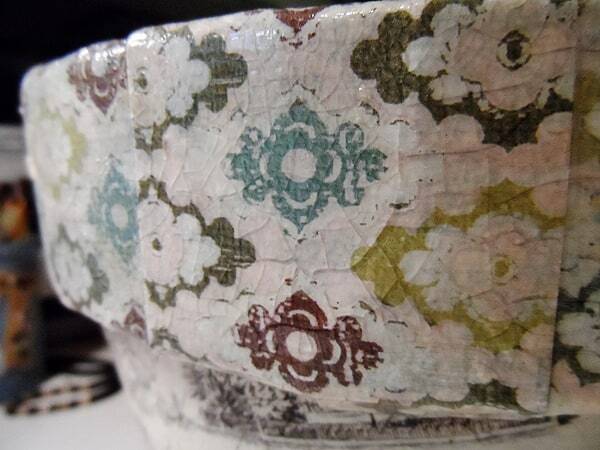 Crackle mediums can be finicky and you are pretty much limited to crackling a paint color. That has recently changed and I’m about to show you how you can add a crackled finish over the top of any design you like! 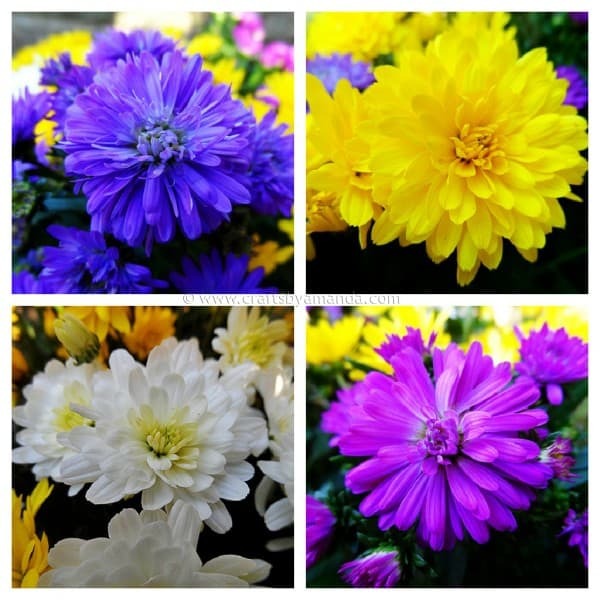 With the official first day of autumn only days away, I thought a flower pot filled with pretty mums would be a great way to introduce you to this project. I know that some people think that the planting season ends when fall begins, but that’s so not true! Whether it be mums and pansies dressing up your garden, or planting shrubs and bulbs, Fall gardening is definitely not over, not by a long shot. So let’s add some character to a plain pot, fill it with pretty mums to dress up the front step. 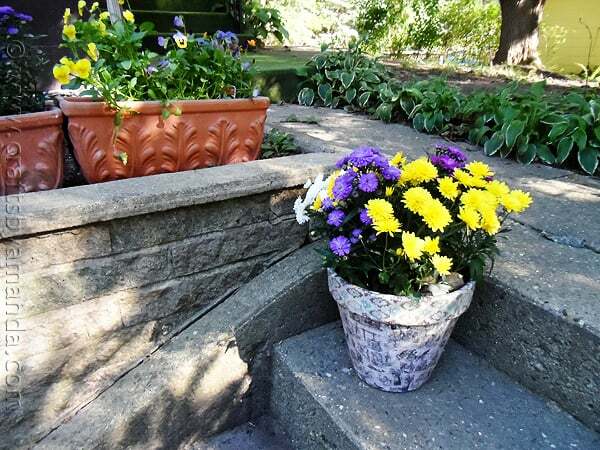 After we’ve finished this project, you’ll want to plant some pretty fall flowers, like mums. This is also a good transition project – in the fall I bring my fairy garden inside, so this is a nice replacement. In case you are wondering about the papers that I used, I found them at Michaels in the individual paper racks. 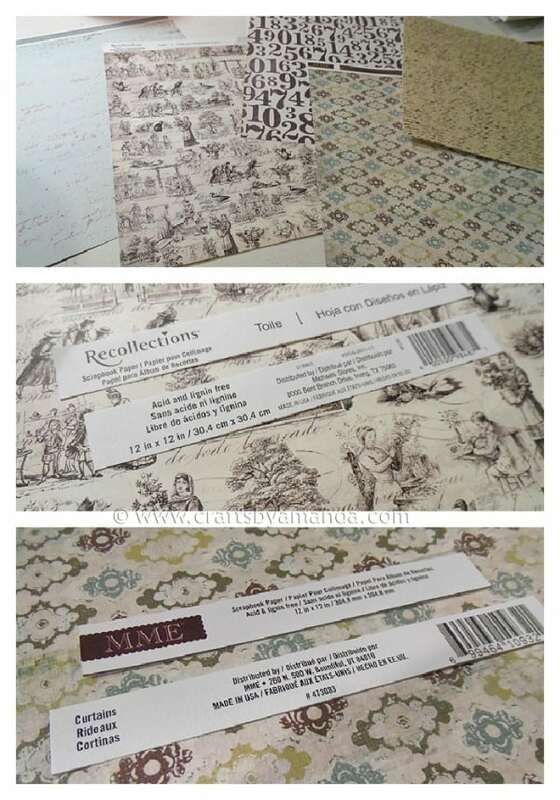 They are Recollections Toile and MME Curtains. 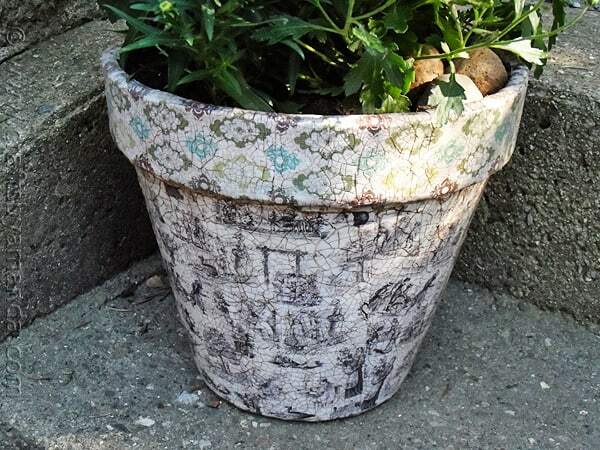 To get started you will need a large terra cotta pot, scrapbook paper of your choice, and some decoupage medium. I cut my paper into strips 4-inches wide to make it easier to apply. Use a large paintbrush to brush the decoupage medium onto the pot, just in a section big enough for one of your paper strips. 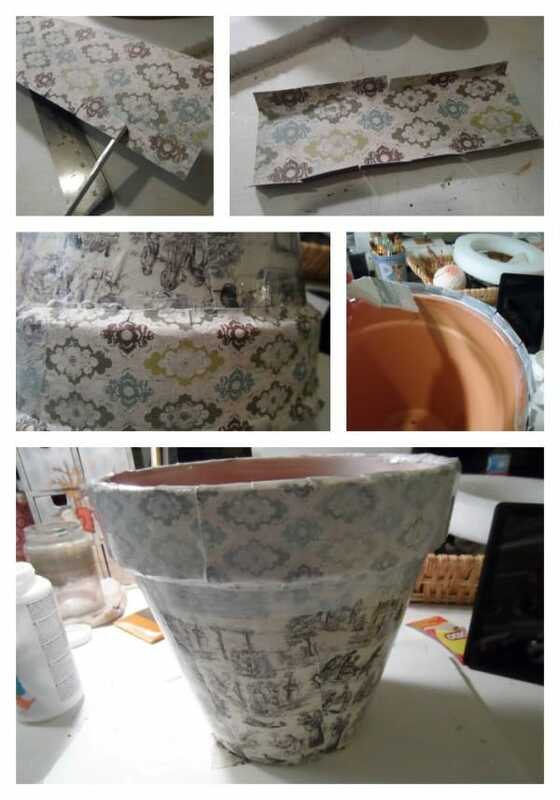 Paint the back of the paper with decoupage as well and apply to the pot, carefully smoothing it out to remove any air bubbles. Repeat until the pot is covered. I actually did the rim of the pot with a different patterned paper than the body. This particular paper was heavier so I cut it into 5-inch lengths and made slits ever inch or so along the edges to make it easier to apply around the top and bottom of the rim. Use decoupage medium as above to apply to pot. Add a generous (but not dripping) coat of decoupage medium over the entire pot and let it dry for at least two hours. Next you’ll apply One-Step Crackle. The trick to this product is NOT overworking it. In fact, you’ll want to try to apply in one stroke if you can, but definitely no more than two or it may not work. The thicker the amount you apply, the larger the cracks will be. I wanted larger cracks so I chose to use a generous amount. You want to allow this to dry for 3-4 hours, but overnight is best. You should begin to see cracking after a couple of hours as pictured above. To make these wonderful cracks visible you’ll need to apply a glaze or stain. I use staining/antiquing medium mixed with acrylic craft paint. I also use a simple household sponge dampened with all excess water squeezed out. Apply the mixture in sections over the crackling with the sponge. Use a soft cloth to wipe back. This will remove the stain from the surface and leave it in the cracks, making them more visible. If it’s not dark enough for your liking, apply it again until it is. After you’re finished and everything has been allowed to dry thoroughly, apply a UV-Resistant clear coat, I used matte finish. This will make it safe to remain outside in the elements without damaging all of your hard work. Next you’ll want to plant some beautiful mums in your new pot! Cut paper into strips 4-inches wide. 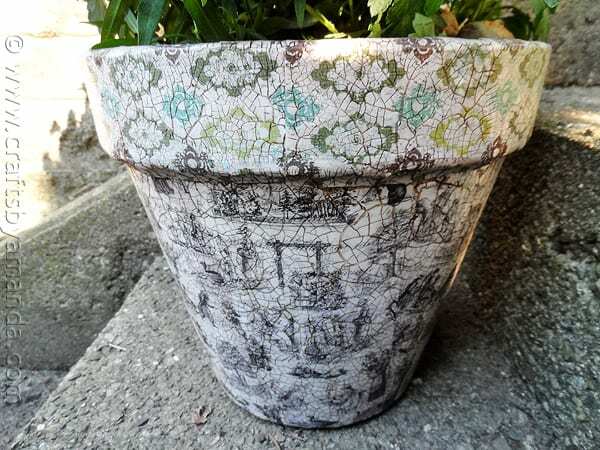 Use a large paintbrush to brush the decoupage medium onto the pot, just in a section big enough for one of your paper strips. 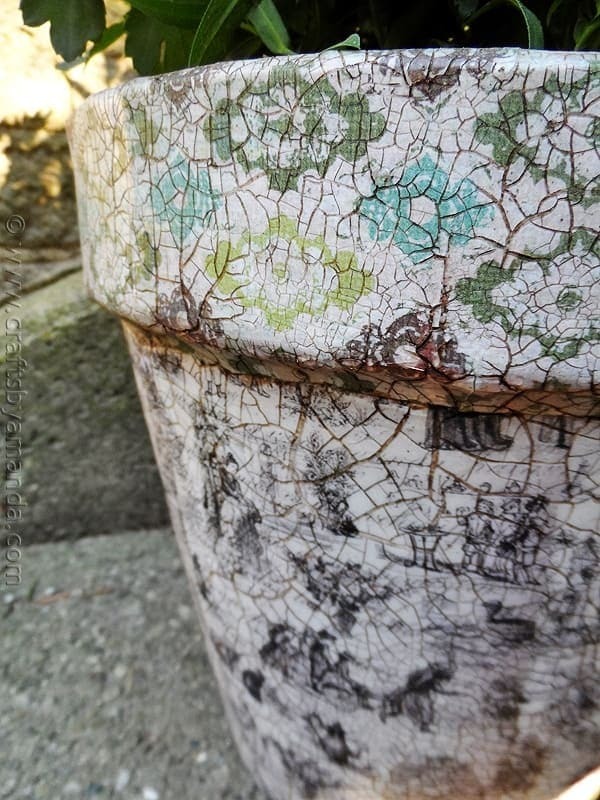 Paint the back of the paper with decoupage as well and apply to the pot, carefully smoothing it out to remove any air bubbles. Repeat until the pot is covered. 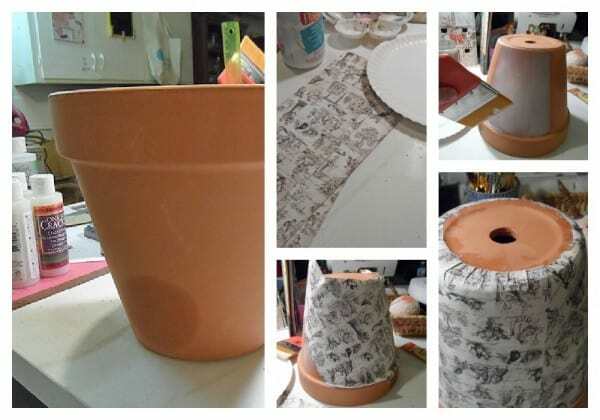 Choose a different patterned paper for the pot's rim. This particular paper was heavier so I cut it into 5-inch lengths and made slits ever inch or so along the edges to make it easier to apply around the top and bottom of the rim. Use decoupage medium as above to apply to pot. Add a generous (but not dripping) coat of decoupage medium over the entire pot and let it dry for at least two hours. Apply One-Step Crackle. The trick to this product is NOT overworking it. In fact, you'll want to try to apply in one stroke if you can, but definitely no more than two or it may not work. The thicker the amount you apply, the larger the cracks will be. I wanted larger cracks so I chose to use a generous amount. You want to allow this to dry for 3-4 hours, but overnight is best. You should begin to see cracking after a couple of hours. 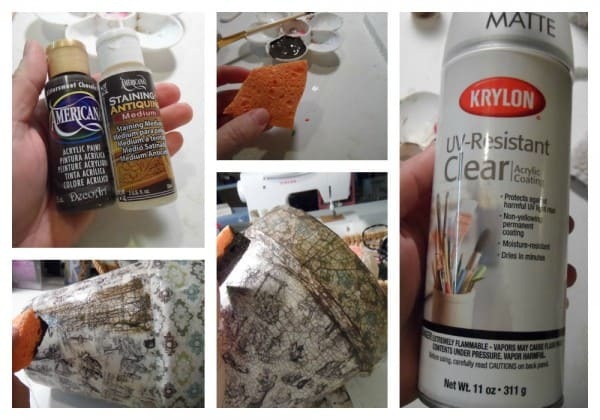 Mix staining/antiquing medium with brown acrylic craft paint according to bottle directions. Use a simple household sponge dampened with all excess water squeezed out. Apply the mixture in sections over the crackling with the sponge. Use a soft cloth to wipe back. This will remove the stain from the surface and leave it in the cracks, making them more visible. If it's not dark enough for your liking, apply it again until it is. After you're finished and everything has been allowed to dry thoroughly, apply a UV-Resistant clear coat, I used matte finish. This will make it safe to remain outside in the elements without damaging all of your hard work. Lovely effect, but I wouldn’t use it on terracotta pots unless I sealed them well on the inside first. Terracotta is very pourous and soaks up water like crazy. 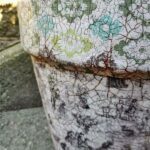 Even if you kept your pot out of the weather, decopauge medium won’t hold up to the moisture wicking through the terracotta from the inside. Maybe the idea is to leave your plants in the plastic nursery container and take them out of the decorated pot for watering. I’ve had this outside for three years and it’s fine. You don’t want to paint the inside if you are going to put a plant in it. Your pot is beautiful! I’ve done this several times and wanted to tell you something that works very well…I use seasonal paper napkins! Just carefully peel the white paper back off and glue to your pot. If you don’t want the terracotta to show through then you can leave the paper on or spray paint first. 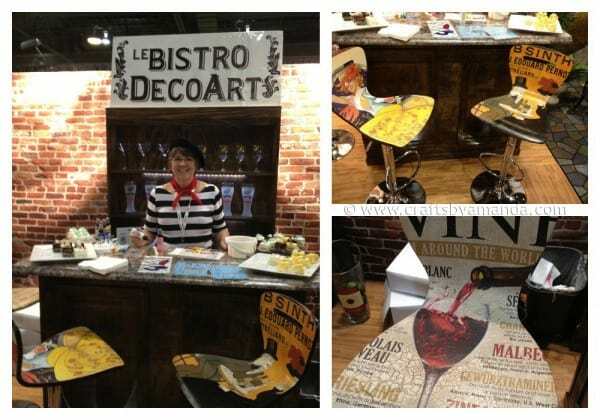 You’re right jackie, paper napkins are great for decoupaging! Very nice work! Which were the 4″ strips of paper glued—horizontally or vertically? Thanks. Fantastic! Thank you for the information, I tend to distress everything I can get my hands on and can’t wait to add this to my arsenal. I love crackle but not its limitations to paint and its fickle nature and tendency to fail. I MUST try this new medium with paper!!! Thank you so much for sharing!! Your tutorial is wonderful and your results are spectacular!! Pin pin pin!! what a fun way to decorate the pots! I love this! Pinning it now! Love this! The crackle look is great! Definitely going to have to make a few! What a beautiful pot!!! I really love the crackling technique. I never realized you could use it this way! I really love how this turned out, the process looks so easy and the result is beautiful! Now I need to get my hands on some One-Step Crackle… 1 step, gotta love it! Thanks so much for sharing. Thanks Jen! I have a feeling I’ll be crackling everything now LOL! This is perfect, I’ve been wanting to make a few crackle backdrops! What a GREAT idea! I may just have to do that! Hi April. Are you using a crackle medium or the one step crackle? I know some people try to do this with glue and it doesn’t always work. I use a paintbrush and while I usually try to do it with one stroke, I have been known to go over it once to avoid drips. Also, you want to make sure you follow the instructions for drying as stated on the bottle. I know this probably isn’t much help, but the only time I’ve had an issue with a product not crackling for me is when I brushed it too many times.